Students and companies in attendance at the annual WIT’s Land Sciences Careers Day (24 March 2017) heard that there is a need for approx. 1,000 candidates to ‘sustain’ the sector. For 2017, FBD have come on board as a main sponsor of the event which showcases potential jobs in the Agri-Food, Horticulture and Forestry areas. 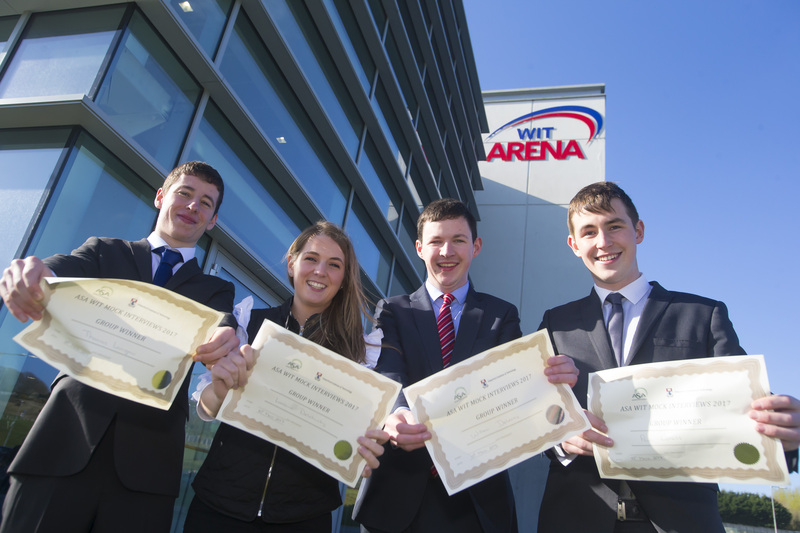 For the first time took place in the new WIT Arena, a conference and events centre on WIT’s West Campus at Carriganore, Waterford. The event was opened by WIT president, Prof Willie Donnelly. Prof Donnelly expressed his gratitude to the industry representatives who give so generously of their time attending such events. He went on to say how proud he is of the students and he wished them all well with their upcoming exams and also in their search for jobs once they finish college. A keynote address was provided by Bill O’Keeffe, former Nuffield Ireland Chairman. Bill had some inspirational words of advice for the undergraduate students as they embark upon the next chapter of their lives. After a networking session where students got to meet with the 50+ companies who were in attendance, many of whom with positions to fill in their organisations, there were further talks from Glanbia, AIB, Kerry Foods, Dawn Meats, Teagasc, Greenkeeping Ireland, Kilmoon Nurseries, GLDA, Western Forestry Co-Op, Forestry Services Ltd., GreenBelt and Coillte. Dr Tony Woodcock, course leader for WIT’s BSc in Agriculture programme said that he was delighted that this event showcased some of the opportunities that await the graduates of the WIT Land Science related programmes. “It is an exciting time for graduates leaving college and embarking out on their career path. The knowledge gained by students at events such as this can help to demystify the transition from full time education into the workplace”. A recent report by the HEA suggests that Agriculture graduates have some of the highest employment rates nine months after graduating from college, which is great news for the current undergraduate crop. Furthermore, job prospects in the region are very strong. According to Edmond Connolly, Regional Skills Forum Manager for the South East, “to just stand still there is a need for approx. 500 recruits in the agricultural manufacturing & services areas to replace the estimated 5% that retire / leave the workforce annually”. Mr Connolly went on to say that in addition to this, when you include farming as a profession, “there is a need for approx. 1,000 candidates to ‘sustain’ the sector. Growing in particular areas is additional to this”. The recent announcement from Dawn Farms of 150 new jobs at its meat science and innovation centre in Co Kildare is an example of the types of roles that the current undergraduate crop can look forward to filling. These jobs will be across a wide range of disciplines, and announcements like this serve to further invigorate the buoyant industry. According to Dr Woodcock, “the really good news that we’re hearing back from industry is that WIT graduates have been performing very well in interviews and in their careers generally in recent times” and this must bode well for current students. Organisations in attendance : AIB, Irish Forest Unit Trust, AMAC, Irish Wood Producers, ASA, Kerry Foods Innovation, Bank of Ireland, Kilmoon Cross Nurseries, Curragh Golfcourse, Kilsaran Home, Dairygold Co-Operative Society, Laois Sawmills, Dairymaster, Macra na Feirme, Dawn, National AgriChemical Distributors, De Paor Consultancy, Nuffield’s former chairman, FBD, Rib World, Callan Bacon, FDC Agricultural Consultants, SAP Nurseries, Forest Harvest Training Forum, Society of Irish Foresters, Forestry Services Ltd., South East Regional Skills Forum Manager, FRS, SWS Forestry Services Ltd., Glanbia, Teagasc, GLDA Teagasc Botanic Gardens, Grantstown Nurseries, Teagasc Forestry Development Unit, Grassland ,Teagasc Walsh Fellowship, Green Keeping Ireland, Teagasc (Kildalton), Greenbelt Ltd., The Forestry Company, Horticulture Industry Forum, Veon Ltd., Irish Country Meats, Western Forestry Co-operative Society.